1 of 4 In a large nonstick skillet, heat oil over medium-high heat. Cook onion and garlic 4 minutes or until softened. Add turkey and cook 6 minutes, breaking up with a wooden spoon; season with oregano, salt and pepper. Set aside. 2 of 4 In a small bowl, combine ricotta and 1/2 cup of the shredded cheese. 3 of 4 Line a 5- to 6-quart slow cooker with a slow cooker liner. Layer half the uncooked noodles into slow cooker, overlapping as necessary. Spread half the turkey mixture and broccoli over noodles; top with half the tomato sauce and 1/4 cup water. Gently spread ricotta mixture on top. 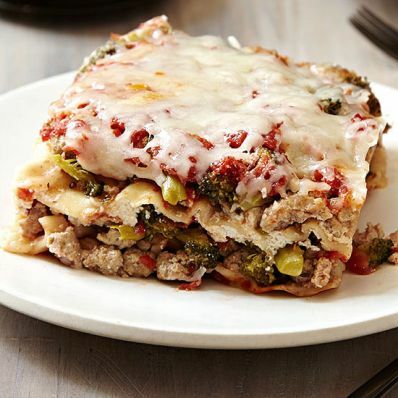 Continue layering with remaining noodles, turkey mixture, broccoli, sauce and an additional 1/4 cup water. 4 of 4 Cover and cook on HIGH for 4 hours or LOW for 5 hours. Sprinkle remaining 1/2 cup shredded cheese on top during last 15 minutes of cooking. Use liner to lift lasagna from slow cooker; slice and serve.